All prices are clearly indicated in the guide's program, so that the participant can see exactly what he is paying for and what is included (and not included). Prices are based upon official pricing used in major peaks and tours for the region in which the tour or expedition is taking place. They are calculated upon the usual departure place (hotel or hut). These can be recalculated if the clients chooses another starting point. You will find the rates for every peak in our Peaks catalog section. For other questions, general conditions for the mountain guide apply here, especially regarding the hiring of the guide, interruption of the expedition due to bad weather, disrespect of a promise made by a client or questions related to the travelling time for a guide. The client is responsible for charges. All the classes, tours, trips or expeditions of a program published on BeMountain can also be done through private hiring, either for one participant or with a group of friends. If the proposed date is not convenient for you, feel free to get in touch directly with the guide responsible for the activity. If you cannot find an offer that corresponds to your needs or desires our guides will be happy to personalize a program just for you and will accompany you on the peak of your dreams or on (almost !) any route. To contact a guide, you can check out our Guides listings. Whatever the formula, guides always place security first, respecting the usual guiding standards and the ethics of the profession. Hiring a private guide is a tried and true formula that has survived through a century of mountaineering and is perfect for the tour you have been dreaming of. This is the most flexible formula to tackle on a mountain. Such a privileged relationship has often blossomed into friendships that have celebrated the successes of prestigious routes on the world's peaks. You will find the list of tours with their cost under Peaks catalog. You don't have a rope partner and you'd like to go on a specific tour ? 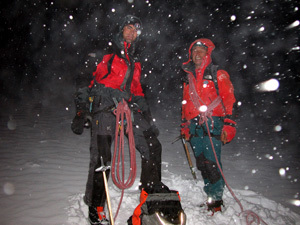 Collective climbs will group climbers together, which helps share expenses. In this formula, the guide sets fixed dates and he has the right to cancel if a minimum number of participants is not met. The tour's difficulty and the current conditions establish the maximum number of participants. You will find a vast array of activities, spanning from one day to multi-day expeditions : rock or ice climbing, snow routes, mixed activities, hut ascents, etc. All of the group guiding opportunities are also available through private hiring. Favored by many, the all inclusive formula is offered in various formats : training sessions, trips, tours and other activities. These specific offers can be found in each guide's program. All prices below include only the mountain guide or mountain leader. Prices do not include insurance, gear, room and board, transportation and ski-lift. Our guides will be happy to organize for you a personalized program in an « all-included » formula, detailling length and tour difficulty, mountain conditions, number of participants and period of the year. To contact a guide, you can go directly to Our Guides. CHF 550.- per day for a second and third guide, if many guide-educators are necessary at the same time. EUR 330.- per day for a second and third guide, if many guide-educators are necessary at the same time. 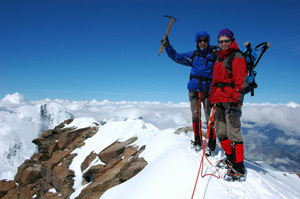 For exclusive themes, such has « mountain guiding» or « risk management » or other specialty courses. For larger groups (more than 4 participants), the organizing guide will be happy to offer you special rates. Any registration must be made using the online registration form posted on the BeMountain web site or sent in writing to the mountain guide's mailing address, accompanied by a 30 % deposit on top of the eventual cancellation insurance. With the payment of the deposit, the participant's registration becomes official. The registration and the general conditions form the content of the contract between the participant and the mountain guide. After registering (on the internet or in writing), the participant receives a confirmation letter or email with a first bill (30 % deposit) on top of the eventual cancellation insurance. Even after receiving the deposit, the reservation is only possible if there is still place available. When a client is accepted, the mountain guide will send him a bill, that also confirms the reservation, and the balance must be paid no later than 21 days for prior to departure (30 days for trips, 60 days for expeditions). If a client registers less than 21 days prior to departure, the full price must be paid with the reservation request. The guides' remuneration is based on the official rates of the national guide associations. According to the SA rate (Special Agreement), the guide can set his own fee. The client must pay for any expense during the tour, such as overnight stays - in huts or hotels - food, and transportation. Unless stated otherwise in the program, fees for insurance, equipment, accommodation, board, beverages, transportation, and ski lifts are not included in the price. The allowance for any day of rest or wait - because of the client's wishes or weather conditions - is at least the daily rate. If the scheduled tour cannot be realised after the overnight stay in the hut, because of meteorological reasons, the guide gets at least the daily rate. When the guide, after fulfilling his commitment, has to take an extra day to return home, he gets a daily allowance according to the rate and his travel expenses. 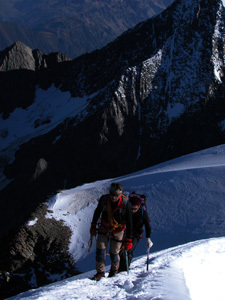 The mountain guide has the right to modify the program and its fees before the contract is concluded. These changes will be communicated when the client registers. There can also be changes to the program between registration time and the beginning of the program. The mountain guide informs participants as soon as possible about the changes and their impact on the price. During the event, the mountain guide is the sole judge when it comes to modifying the program. Such changes can be necessary because of factors related to meteorological and mountain conditions, the participant's physical condition, technical capabilities, and safety. The participant is aware that such modifications can occur during any mountain tour. In a situation like this, the mountain guide is authorised to suggest a different route or another area; in so doing, the obligations of the contract are entirely fulfilled, the participant has to meet any supplementary expense. There is no guarantee that the ascent of the summits chosen will be completed. For other questions related to the hiring of a guide, the general conditions for the mountain guide apply here. The effort put in planning and achieving a high mountain tour is often out of proportion with the guide's salary. Withstanding long distances, hours at a time, measuring itself in places where danger exists, doubting you?ll make it to the top... The guide has to manage through all these and a large amount of responsibilities. In mountains, a bad decision can have large consquences. Guides spend most of their time controlling danger. They keep up with the evolution of their trade, always learning new techniques. Hiring a guide is hiring competency, resulting from a passion, but also from concessions and years of experience. This career cannot be lived without passion : it is alsmost impossible to live solely on a guiding income. Only a hundred of Switzerland's 1450 mountain guides work full-time. Revenue fluctuates according to weather and it is often hard on family life. Only the passionate survive in a profession where hardships are as numerous as victories. It is more than a passion, it is a calling, a way of life. Full-time guides shy away from fortune, they are more bronzed than golden. However, guides more keen on the positive sides of their profession, less on the financial difficulties. If the price of the tour or trip is not within your budget, it is alway possible to join a group to share the expenses. 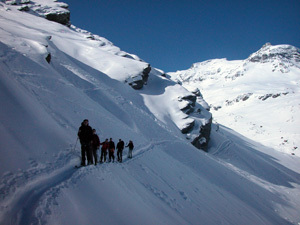 Group guiding is a good way to get acquainted with mountains. Also, through BeMountain's search engine, mountaineers can look for partners interested in the same tours (and you get to split the bill). To do so, search under the « group » profile (more than 3 people) or under the « private » profile (for a maximum of 2 people). Detailed information for the tour will indicate the number of participants that have already booked.